The Son is the Father’s infinite and eternal act of self-reflection from everlasting to everlasting. “When the Father mirrored Himself in the infinite, he produced one Image with all the perfections of the Infinite,” and we call Him Jesus, the Son of God. Creation, on the other hand, is a type of mirroring of God, but not such that it is an emanation (Catechism of the Catholic Church 300), but an expression of His wisdom and love (CCC 295). We might think, too, that the Father would need to create a perfect mirroring of Himself in the finite creation, but He does not need to see Himself thus. “For God could love things less than Himself and act to give them pleasure.” So, He conceived creation with all its numerous variety because, out of His goodness, he thought that they should have a chance to enjoy Him. Thus, creation shares in His goodness (CCC 299) and finitely mirrors Him to varying degrees of perfection, beauty, power, and intelligence. Sacred Scripture teaches us that we may even begin to perceive His divine attributes in creation such as His: deity (Romans 1:20), glory (Psalms 19:1), sovereignty (Revelation 4:11), power (Isaiah 40: 26, 28), goodness (Psalms 33: 4-9), etc. What does this have to do with the Immaculate Conception? Everything! In the creative mind of God, there was one creation whose excellence far exceeded the rest of humanity because of her mission to be the Theotokos (CCC 490). Preserved from original sin, she is “the most excellent fruit of redemption” (Sacrosanctum Concilium 103). A fruit of the Immaculate Conception is that she becomes the New Eve (CCC 511) and, I believe, the greatest expression of finite human love. It has been my experience that many Catholics treat this dogma as either a dogmatic act of necessity (She had to be sinless in order for Jesus to be incarnated without sin, which is necessarily true), or they avoid the dogma because they consider it a frustrating meditation of her perceived “skate through life” gift that none of us can or will be able to achieve or relate to. I think, though, that this gift also carried a sweet burden with it. To be preserved from original sin is a call to love. 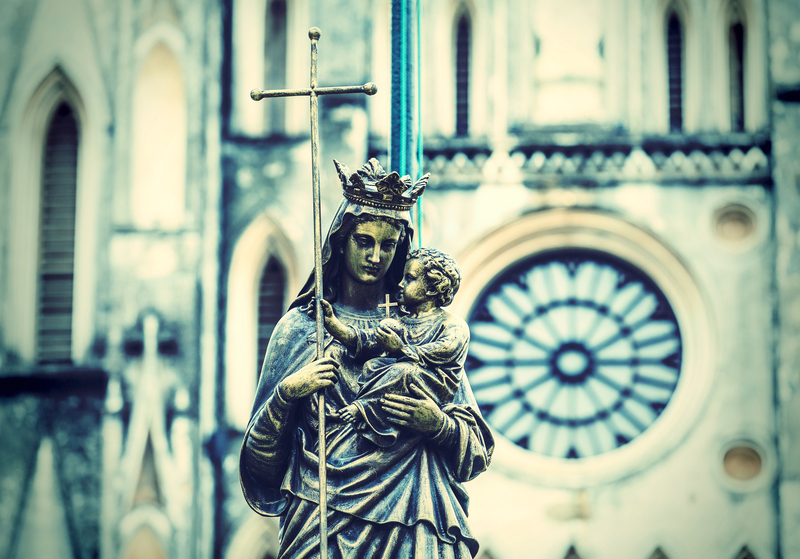 I think we forget that since she was conceived without sin and Our Lady never committed personal sin, her capacity and freedom to love was and is immeasurably greater than ours. Conversely, it also means that her capacity to perceive and empathize with the brokenness of the human condition is beyond our, or at least my, ability to conceive. I am not saying that it is or was infinite, but that we are so mired in the stain and experience of personal sin that we tend to reject any notion that it is beyond our capacity to imagine or understand the width, depth, and breadth of not only her love, but love in general. As St. Augustine once preached: “The Virgin’s love conceived first in her heart and then in her womb” (cf. Sermon 293). It is for this reason that I come to her in prayer to teach me how to love, not only our Lord but my family, friends, and even the stranger. I need her assistance in order for me to encourage me to love and serve with a generous heart. I also need her to teach me how to appropriately deal with the injuries that will inevitably occur in interpersonal relationships. Why? She experienced to a greater degree every slight or comment in her relationships more than I could and, yet, loved those in her life where they were at, and prayed for what she hoped they would be. Tell me ——- for you know. This entry was posted in Deacon Marques Silva and tagged advent, Blessed Trinity, Blessed Virgin Mary, catechism, Catechism of the Catholic Church, creation, dogma, generosity, God's Love, good example, imitation, Immaculata, immaculate conception, love, Mary, Our Lady, prayer, preparation, Sacred Scripture, scripture, sin, St. Augustine, Virgin Mary, virtue. Bookmark the permalink.